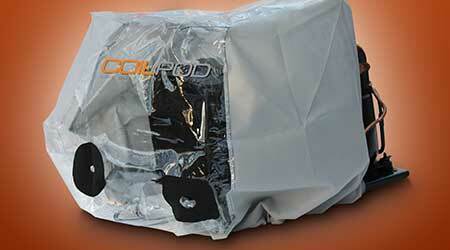 CoilPod LLC announces the launch of the CoilPod dust containment bag which is an environmentally-friendly solution for the indoor cleaning of self-contained condenser coil units in plug-in cooling appliances of all types. These units are contained in retail food and beverage outlets, hospitals, schools, pharmacies, and in many other commercial settings. A person desiring to clean the condenser coils contained in such appliances first places the CoilPod bag (approx. 25 inches wide by 12 inches deep by 20 inches high) over the coil structure and then simultaneously supplies compressed air and vacuum, e.g., from a standard wet/dry vacuum, through two ports in the bag’s surface to remove debris from the coils while vacuuming out of the bag. The bag entraps the removed debris during the cleaning operation protecting the environment outside the bag from undesired contamination.